Indonesia’s #1 tech conference, startup competition and hackathon is back! 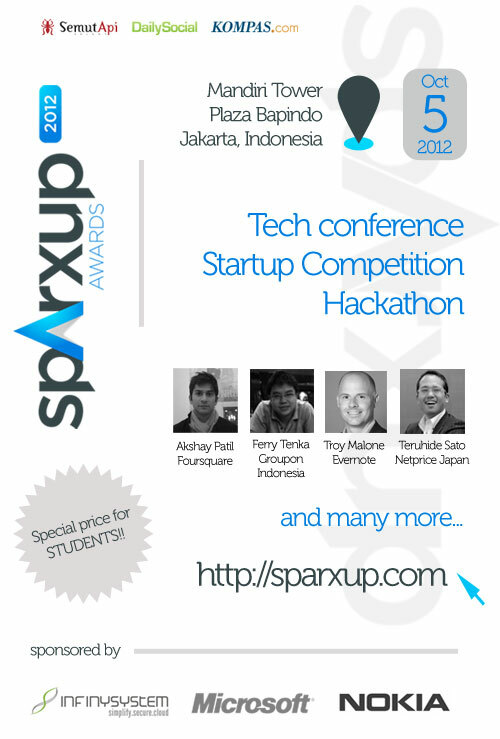 Sparxup returns this year to Jakarta for its third edition – its inaugural conference was in 2010 – and will feature many of the best and most promising technology startups in Indonesia together under one roof. An initiative by technology blog DailySocial, news site Kompas.com, and consultancy SemutApi, Sparxup is set to put Indonesia under the internation spotlight from investors, entrepreneurs and multinational technology companies. The three-day event starts on October 3 with an all day hackathon session, followed by a Demo Day for startup finalists on October 4 and ends off on October 5 with the Sparxup Conference and Award Night. The full-day conference will see speakers from companies like Foursquare, Evernote, Netprice Japan and Microsoft sharing their knowledge and expertise with participants. Aside from Besides international speakers, local entrepreneurs such as Hendrik Tio of Bhinneka.com, Indonesia’s most successful online store, as well as Ferry Tenka from Groupon Indonesia will share their thoughts about Indonesia’s tech scene together with other speakers from Yahoo! Indonesia, music startup Ohd.io, and cloud-provider company, Infinys. “Promoting Indonesia’s tech startup scene as always been our main objective with Sparxup, as well as bringing international knowledge to local entrepreneurs,” says Rama Mamuaya, founder of DailySocial and Sparxup 2012’s chairman. As a way to promote a new generation of technology change-makers, Sparxup is offering a special discount for students to participate in the conference and gain precious industry knowledge. For more information on the event, including ticketing, sponsorship and full agenda, visit the Sparxup website.